Reading about the first day introductions at a language school. It is followed by two comprehension activities and a key. 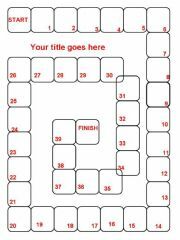 Reading comprehension activities for first year students. 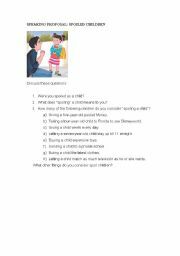 Comprehension questions for intermediate students. Planning a dream holiday. Gathering information online, designing a poster and giving a short oral presentation. 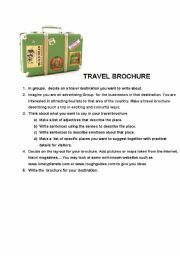 Worsheet for students to write a brochure about a holiday destination. 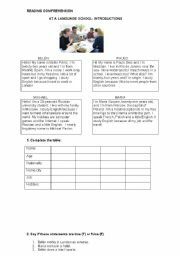 Different situations in which students will have to discuss these topics in pairs or groups. 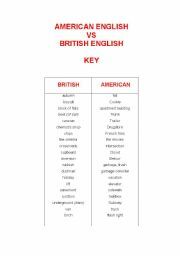 This is just the Key to American and British Vocabulary PPT. 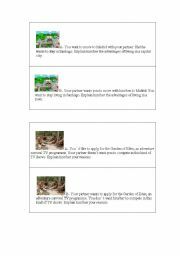 Sorry Iǘe tried to put everything in just one printable but I wan�t able to do it. A speaking proposal for advanced students about what people think spoil children. 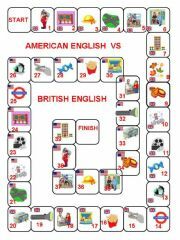 This is a board game designed to practise main American an British vocabulary. Simple power point to explain the present simple in affirmative, negative and interrogative form. Explanation and practice. Good for adults and teenagers. Power point with explanations and exercises. It�s good for secondary and sdult students.